all things sweets and indulgent. Gluten free, wheat free, dairy free and refined-sugar free. This is a little piece of paradise I’ve created for both of us. Each week I head into the kitchen, put the problems of the world aside, and some good music on, until I come up with something that excites me. Once that happens, I know it’s ready to give to you! Nothing leaves my kitchen until I am confident it’ll blow your mind and your tastebuds. Are you a visual learner ? Yeah, me too. If I can’t be there in person, I love a video. Russell James and I put together this little video series for you. It’s a way for you to dig in to raw chocolate making, learn some best kept secrets to it’s success and see if it lights you up! 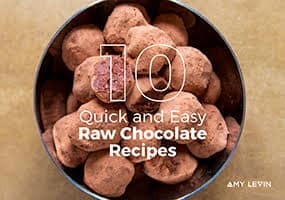 Make delicious raw chocolates and raw desserts your family and friends will be raving about with this FREE eBook containing my most popular recipes. Balanced flavours, beautiful texture that aren’t too sweet. A tasty collection of free raw chocolate and dessert recipes for you to dive into. Recipes range from easy to more challenging with a new recipe being added each week. I had been frequenting Amy’s website for a few years and have always loved the enticing recipes. One day, after I tasted several Ooosha chocolate bars, I knew I had to meet her and learn how you make raw chocolate divine.